You are here: Home / Food / Give a Gift They’ll Love: New Dunkin’ Donuts Seasonal Coffees Make Holiday Gift Giving Easy! Give a Gift They’ll Love: New Dunkin’ Donuts Seasonal Coffees Make Holiday Gift Giving Easy! Dunkin’ Donuts Makes Holiday Gifting Easy! If you’ve never had Dunkin’ Donuts, you are totally missing out! I know that there are tons across the US and I believe in Montreal, there’s Dunkin’s so, hopefully most of you know the goodness that it is. We are strictly a coffee family for many generations, though I do enjoy a cup of tea but–coffee is just a go-to for everyday and especially the holidays! We are lucky enough to have Dunkin Donuts a bridge away and they never ever disappoint! 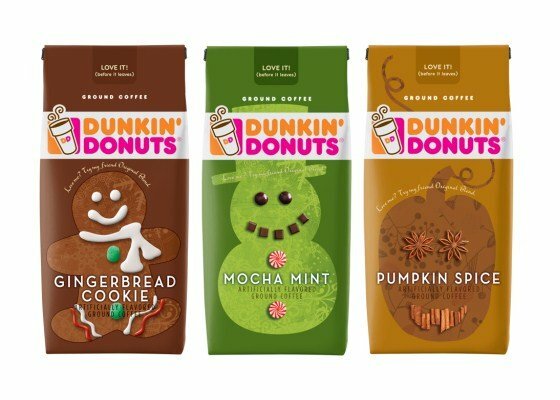 Dunkin’ Donuts® packaged coffee is celebrating the holidays with a new Gingerbread Cookie variety! Jump into the season with a big mug of delicious Dunkin’ Donuts coffee at home with friends and family. Other holiday varieties include Pumpkin Spice and Mocha Mint. Complementing its whimsical packaging, select bags of Dunkin’ Donuts seasonal coffees include a paper gift tag, making it the perfect stocking stuffer, hostess gift or holiday treat. I think I am super excited to try the Gingerbread coffee and can’t wait to go grab some of these holiday gift bags for the coffee lovers in my life–and there’s quite a few of them! Make sure you stock up on New Gingerbread Cookie and Other Seasonal Varieties as soon as you can because they are available for a limited time only! With the festive and decorative packaging, Dunkin Donuts sure made it easy to gift the gift of coffee this year! They are super and totally cute AND tasty! I am a fan of the Pumpkin Spice and would actually love all 3! Tips Straight from Dunkin’ Donuts to Make Your Gifts Look Amazing! Tie Two Together – Have the gift and its wrapping complement one another. Place a bag of new Dunkin’ Donuts Gingerbread Cookie coffee in a cookie jar. Present the Pumpkin Spice variety in a basket of mini-pumpkins, or serve Mocha Mint with a favorite chocolate bar. Two in One – If gifting seasonal food or beverages, pair the gift with serving items.For example, offer Dunkin’ Donuts packaged coffee in a mug, or wrap the package with a ribbon attached to a coffee scoop. Monogram Madness – Personalize presents by including the recipients’ initials on the wrapping. Write their initials all over the paper or affix cut out letters or cookie cutters in their initials as gift tags. What flavor would you love to try? If it’s coffee, I’m in! This content has been compensated. However, all thoughts and opinions are my own and have not been influenced in any way. Please see Whispered Inspirations full disclosure. Previous Post: « Kraft First Taste Canada: Try New Products, Get Delicious Recipes and Earn Points and Get Rewards! Oh how I love coffee. I never do flavoured coffee…well I indulge once in a while in artificial flavour at Starbucks…Peppermint Mocha cravings…LOL! My recent post A Year in Review being a part of #FisherPriceMoms and Holiday favourites..
Oh, I'd try the gingerbread one for sure! My recent post I don’t want to give up my Instagram. BUT.